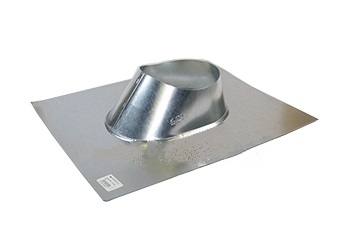 PRODUCT: 6-inch Roof Pipe Flashing / Pipe Jack, 26 Gauge Galvanized Steel. Fits 6-inch size pipes on flat to 5/12 pitch roofs. Price/Each. (shipping lead time 2 days) Riser Top Opening: 6" wide, Base Size: 21-1/2 x 19-1/4". APPLICATIONS: Fits flat to 5/12 pitch roofs. Standard flashings are generally acceptable for use with steel and soil pipe, ABS, PVC, plastic or EMT (electric metal tubing). OPTIONS: Available in aluminum. Other sizes available to fit pipes 1/2 to 30" pipes.